"The original Uthmani Rasm (Orthography) as written by the scribes of the revelation, may God be pleased with them, according to the order by the messenger, Peace be upon him, according to the Holy spirit, Gabriel, may peace be upon him according to God be He glorified." 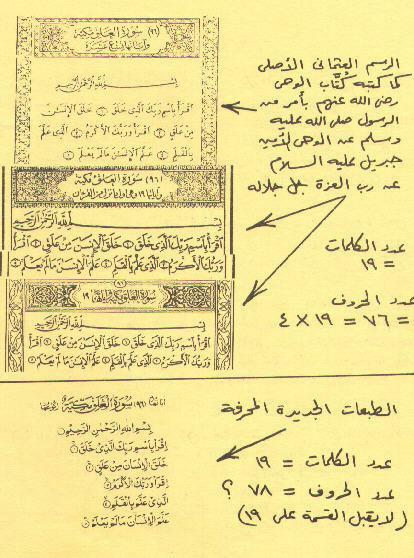 The arrows drawn by Rashad point to three different editions of the "ORIGINAL" Quran, the kind you find in our homes, book stores and libraries. 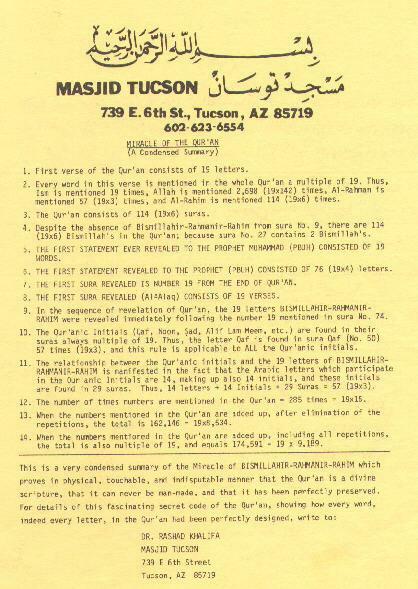 "Number of words = 19 Number of letters 76 = 4 X 19"
Images of the first five verses of sura 96 as seen in three original Qurans and in one corrupted Quran. "The new corrupted editions", "Number of words = 19 Number of letters = 78 ? not a multiple of 19."